I haven't been doing such a great job at blogging my trip! It is amazing how busy one can get while road-tripping!! 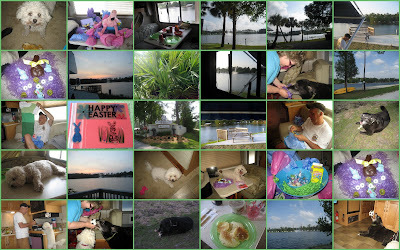 We celebrated Easter....our first holiday in the RV...which was nice....and very different from any other Easter! Fortunately the weather cooperated and it was a very pleasant 82 degrees with a slight wind. Much better than the snow that my sister said was occurring at home! Oh, we could SOOOO get used to this! It IS much easier to clean a smaller space...something I hadn't really thought about before. We have had to learn to keep things put away and organized...otherwise we'd never find anything and the place would look like a dump!! The dogs are adapting well. Travel days are the most stressful. Mostly due to the fact that LadyBug is like a barnacle with me. She HAS to be with me every single minute....and if she's not she makes it VERY well known!! When we left Myrtle Beach and headed towards Georgia, I had to drive the golf cart back to the rental office while Ben followed in the RV. I had zipped both the girlz into one of their travel crates, then got out, hopped in the cart and was on my way. By the time I returned the cart and walked across the parking lot to the RV...both dogs were out of the crate and peering at me out the window. Ben said they were SCREAMING, WHINING, and pawing to get out...so that didn't work very well. The bark collars have been worn a few times, and they don't like to wear them. As we continue to go from place to place, they have become much more comfortable. We rented a car for a couple of days so we could check out Amelia Island and Fernandina Beach....two of my favorite places on earth. We left the girlz and Zip in the RV with the air on and the tv on...we were not gone more than four hours and they did very well. It IS hard to leave them and one of Ben's biggest complaints on this trip has been....the dogs....always having to worry about them. Yes, we do have to give up some of our freedom, but I personally would not have it any other way. Love me. Love My Dogs. Very Simple. Husband doesn't agree. He would rather just be able to get up and go. My dogs give me so much unconditional love on a daily basis and ask for so little in return. It is truly amazing how many pets we have run across on this trip. We have been in five different resorts since we left a month ago. We have run into VERY few people who do not have at least one dog or cat. It seems that everybody has a pet....of some kind!! Our neighbor at the last one had SIX pets!!! And I even changed my reservations because some resorts do not allow more than two dogs. Not one single park has asked me for any health records on any of the pets. Nor have they counted how many pets I have. Kind of amazing. Off to stow away things for our travel day tomorrow....hope all's well and hope y'all had a Happy Easter!! Keep on having fun and taking pictures so we can see your travels. nice to hear you had a relaxing, warm easter jeanne! BTW, love the dog trying to help cook pic. Silvieon4 who now owns daddy. You know we left our cats behind on all our trips. It broke my heart and I cried for days missing them. It did give us tons of freedom to do whatever we wanted - but my heart often was back with them. Now I wonder how much they missed us while we were gone and cry about those times we could have had with them. Pets are more than special. They are angels here on earth - sent to lighten our hearts and make us smile and realize what love truly is. I am surprised that you aren't towing a run-around vehicle. We have met so many people who have wished that they had as they become so limited in what they do. A thought for next time perhaps? It's easy enough to do. And yes - it is lovely to live in the smaller spaces. So comfortable - and it brings you closer to your special other. I nearly laughed till I cried when I read Karen's comment above!!!! The fact is, our little pets are just like kids...life would be easier without them around, but would be nearly intolerable!!! I have to smile about your revelation....I could EASILY live in camper. So much life is done outdoors and one realizes just how WORTHLESS some of our "stuff" really is!!! Looking forward to your next digs! That just sounds wonderful. It's finally starting to warm up here .. starting to anyway. I wonder if the 'barnacle' is to ensure you don't forget her anywhere? I bet she'll get less clingy the more you travel with her (unless you encourage the clingy-ness). Have a great time out there! Keep on RVing and having a great time. Can't wait to read (and see) more of your trip on the blog.